The Beast of Bodmin Moor was really just a large domestic cat according to a study commissioned by the British government. Two tabloids, The Sun and the Daily Mail, revealed the results of the 1995 investigation, based upon information taken from a chapter in my book Britain’s X-traordinary Files, published by Bloomsbury in September. The story follows the scare in November in which soldiers and armed police searched a suburb of Paris after sightings of ‘a young tiger‘ near a supermarket. A lengthy search of the area failed to locate the tiger or any trace of an escaped cat. And two years ago police in Essex spent £25,000 using helicopters and marksmen to search a caravan park near St Osyth after holidaymakers reported seeing a lion on the prowl. Again nothing was found and the story quickly slipped out of the headlines. What makes us see mystery big cats where they don’t exist? Does the report on the Cornish beast provide us with answers? Firstly what The Sun calls the ‘newly unearthed government files’ about the Beast of Bodmin have been in the public domain since shortly after the study was published in 1995. But their contents have been ignored, possibly because they make uncomfortable reading for those who believe that large undiscovered felines are living secretly alongside us in the British countryside (see also Doubtful News post on the role played by the media). The investigation was widely advertised in Cornwall, with farmers and members of the public invited to submit evidence to inspectors. From the outset, ADAS admitted it would never be possible to prove that such an animal, or animals, did not exist. But they believed if it did hard evidence would be found and the team spent six months collecting sightings, videos and still photographs and reports of suspected livestock kills and injuries. The report proved a devastating blow for those who believed the Beast of Bodmin Moor was a real big cat. The team used large measuring poles to demonstrate the heights of walls and other natural features against which some of the creatures had been photographed. 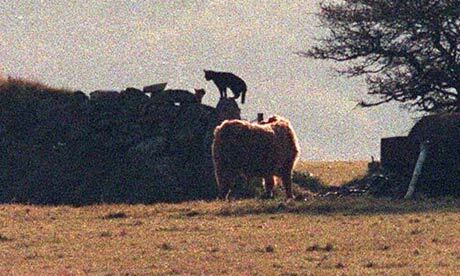 One classic photograph of the ‘Beast of Bodmin Moor’, taken by press photographer using a long focus lens, appeared to show two ‘big cats’ posing on a stone wall, with one balanced upon a gatepost. When this was re-photographed with a one metre tall ranging pole providing scale to the gatepost, the ‘beast’ was clearly shown to be no taller than 30cm (12 inches) tall at the shoulder. It was, in fact, a domestic cat. Several other still photographs and video sequences, taken in daylight, were subjected to the same technique. In each case, the black animals depicted were revealed as no larger than domestic felines. 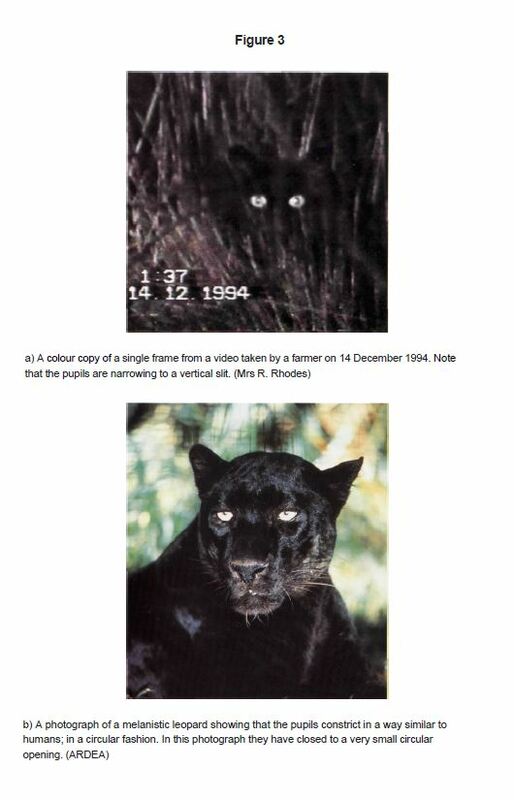 One sinister night-time shot that claimed to show the eyes of a young leopard in close-up was compared with an image of a real black leopard. The pupils of the ‘beast’ photographed in Cornwall could be clearly seen in the light of the farmer’s lamp as narrow vertical slits (see image, below right). This type of constriction is not found in the pupils of larger cats like leopards and pumas. The investigators concluded the animal in the photograph was a domestic cat. Examination of footprints and alleged big cat ‘kills’ were equally disappointing. Three plaster casts of prints taken on Bodmin Moor were examined and it was concluded that two belonged to an ordinary cat and the third to a dog. Of the small number of livestock kills that were followed up by the team, none produced any evidence for the presence of big cats. Traces of indigenous predators, such as badgers, crows and foxes were found, in most cases as scavengers after sheep had died from natural causes. In 1998 Labour Elliot Morley MP, the parliamentary secretary for the Ministry of Agriculture, Fisheries and Food, was quizzed about the study in Parliament (read the extract from Hansard here). He said his prime concern was the potential threat big cats, if they existed, might pose to livestock. Morley said his officials received many such reports every year and although the ‘vast majority of reports are not genuine sightings of big cats’ the subject was regarded as ‘a serious issue’ by the government. In his book Feral the journalist and environmental lobbyist George Monbiot asks why there has been so little discussion of the big cat sightings in the scientific literature. Monbiot interviewed a number of people near his home in West Wales who have seen a large black cat, said to be 6ft in length and 3ft high, that has been dubbed ‘the Pembrokeshire Panther’. He became convinced of their sincerity and their claim to have no prior knowledge or interest in the subject before their personal experience with a big cat. Nevertheless, he found it impossible to accept such creatures could be so common without hard evidence emerging of their existence. After consulting psychologists, Monbiot began to realise how witnesses could turn ordinary cats into extra-ordinary ones by magnifying their size out of the context of their surroundings, as the analysis of photographs taken on Bodmin Moor proved. Monbiot speculated ‘whether there might be a kind of template in our minds in the form of a big cat’ that we have inherited from our ancestors. When we are confronted with something ‘that vaguely fits the template’, in sudden and unexpected circumstances, ‘the template triggers the big cat alarm’. The influence of mass media stories and images of big cats from zoos and films may also play a part in shaping how such ‘sightings’ are interpreted by eye-witnesses. Perhaps next time the police receive a sighting of a ‘mystery big cat’ prowling the suburbs of a city or town they might consult a folklorist or a psychologist first before they call out the marksmen or scramble helicopters. This entry was posted in Uncategorized and tagged ADAS, alien big cats, Beast of Bodmin Moor, Bloomsbury, Britain's X-traordinary Files, Cornwall, Department for the Environment, Elliot Morley MP, Essex lion, Feral, Fisheries and Food, George Monbiot, Ministry of Agriculture, Paris tiger, the Pembrokeshire Panther. Bookmark the permalink. 1 Response to Cat’s out of the bag? Always seems to me that the folks taking the photos of the big cats learned their photographic skills at the same school as the people photographing fleets of alien spaceships and bigfoot.